appreciate reptiles, insects and small mammals. “We can’t say enough great things about our experience with critter connections for our sons 5th birthday party! From Michael being so great to talk to about the party and all the details surrounding the reptile program, to Caryn putting on an outstanding show! She was so great with the kids and provided so much information about all the different reptiles we saw! This made our son's day and he still talks about all the reptiles all the time! We would definitely recommend this to anyone, it was a fantastic time and such a cool way to see reptiles up close! Mike was wonderful. The children had an amazing experience touching and feeling those creepy crawlies. The presentation was very educational as well. There were lots of squeals of excitement from everyone. The lizards and the snakes were the favorites! I just wanted to thank you for a wonderful party for my son James. Everyone had a great time and enjoyed all the animals. Even some of the adults that said they would not touch certain animals conquered their fear and held a snake or the tarantula. Kevin did a fantastic job and even arrived 20 to 30 minutes early so jimmy could see a few animals before the presentation started (which i was not aware you guys did that but that made it extra special), We requested the scorpion because jimmy was very excited to see and hold a scorpion and he really enjoyed that and i (his mom) enjoyed seeing and touching all the animals as well as the other kids and adults. Kevin was extremely nice and even stayed longer than expected to accommodate some guests that arrived a little late. I would absolute recommend you to anyone and one of my friends relative has already booked a party in may for her son colin. Thank you again. Autism York would like to thank you for being a part of our annual Walk for Autism and Autism Expo! Our families absolutely LOVED seeing and interacting with all of your critters! They were the hit of the day, and I heard from many families how amazing you were and how fascinating your animals and critters were. 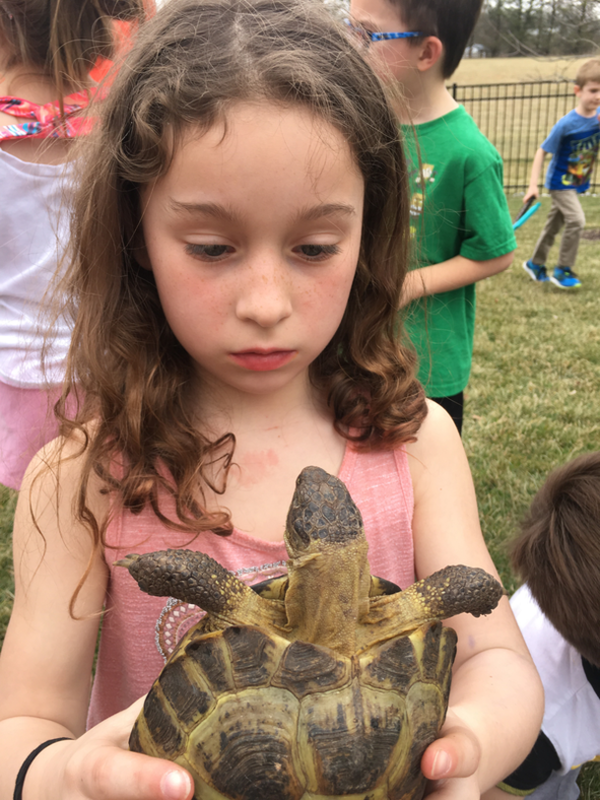 Children love holding and touching our fascinating animals like this Russian Tortoise who we bring to all of our programs. If you enjoy touching and learning about fascinating animals that are rarely seen close-up, we have great news! 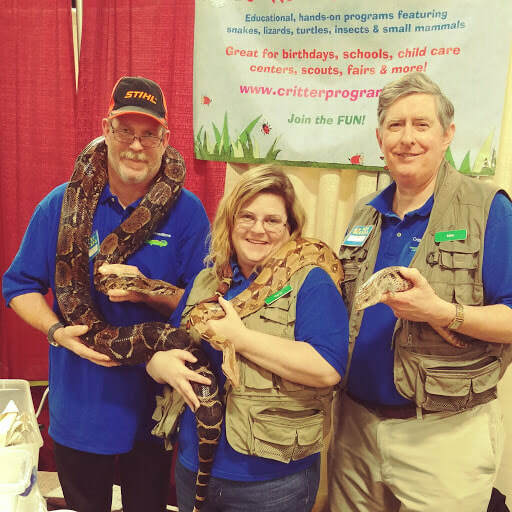 Our experienced animal presenters are ready to provide an educational and entertaining animal presentation for your birthday, school, scout group, child care center, senior event, fair, camp program, library and other events. Our presenters, Mike, Caryn, and Tracy have more than 20 years of experience in the care and management of animals and have offered fun, hands-on presentations to thousands of children and adults in the South Central Pennsylvania area and beyond. We will tailor our programs to meet a variety of needs and budgets. Corn snakes, milk snakes, king snakes, ball pythons, red tail boas, and many more. A variety of tortoises and water turtles. Blue-tongue skinks, leopard geckos, fat tailed geckos, crested geckos and other lizards. Tarantulas, hissing cockroaches, scorpions and other invertebrates. While you're here at our website, read about our Programs, check our schedule of Upcoming Appearances, look at our Photos, read our Testimonials and a Message from Mike.